By DAVE MADDOCK | Product Manager, Attachments, Fecon Inc. In operation, the first thing that you notice is how slow the blade is turning. “How could this possibly be getting any work done?” might be your first thought. But once the main blades engage, the results speak for themselves. On a typical 12-inch stump, the Stumpex can cut from 8 inches above ground to 8 inches below ground in less than four minutes. One pass and you are done on stumps up to 24 inches in diameter. On very large stumps, multiple cuts can be performed and in certain conditions, cuts from different angles do the trick. And because of its design, the Stumpex does not take extensive training before your operator is proficient in this application. 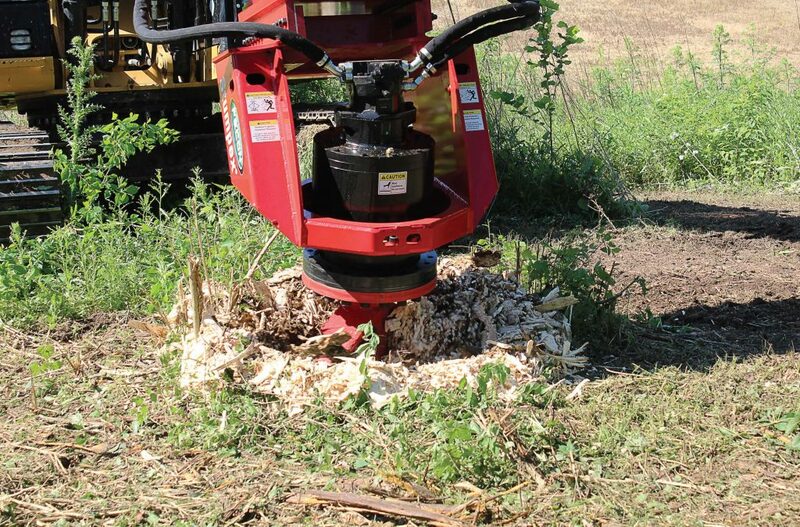 When it comes to safety, traditional high-speed stump grinders require significant and time-consuming site preparation before the operation can commence. The Stumpex does not require fencing, guarding or window protection. I’ve even watched as a city street department worker removed a stump with the Stumpex next to a new pickup parked on the street. A slightly nervous homeowner looked on but was soon pleased to know that all was well with his truck and his lawn. And, since the Stumpex doesn’t throw any debris, the operator felt much safer, as well. Consider the task of stump cutting in a municipal park. 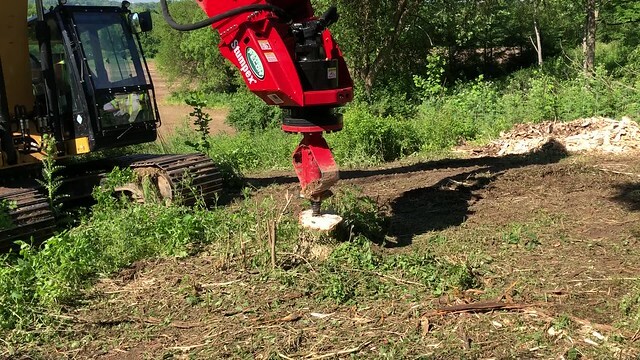 With the Stumpex mounted on a compact track loader, or CTL, not only is damage to the sod minimized, but cleanup of the stump takes only a few minutes. All of the stump material that is cut is still in the hole. Or, take cleanup after a storm. The last thing that municipal workers need to worry about is clearing the area so they can remove a stump. No need with the Stumpex, they can work alongside other cleanup crews without safety concerns. The Stumpex can be mounted on traditional skid-steer type loaders, compact track loaders, rubber-tire backhoes and now, with the new Stumpex EXC 20-ton model, even hydraulic track and wheel excavators rated from 16-40 tons. The Stumpex does require a case drain line and is compatible with hydraulic flows of 17-42 GPM in addition to pressure up to 4,000 PSI on the standard model and 5,500 PSI on the EXC 20-ton model. The standard model weighs 1,368 pounds, and the EXC 20-ton model weighs 2,000 pounds. 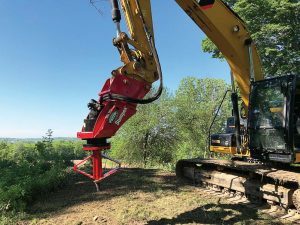 Although safety is the key to this new design, low maintenance and operating costs are attributes that set this product apart from high-speed rotary stump grinders. With no carbide teeth to replace, the Stumpex has very low operating and maintenance costs. With traditional high-speed rotary stump cutters, the cost of replacement carbide cutting tools can soon eclipse the cost of the machine. With the Stumpex, keeping the main blades sharp only requires periodic touch-up with a disk grinder, and the nose cone is replaceable by the owner when it wears out. Our regional managers do a good job demonstrating the Stumpex, as well. We will ship a demo unit to our local dealer, attach it to a skidsteer or excavator for the demo and let the customer see for himself. It really is a product that needs to be seen to be understood. This product has been so successful that there is still a wait list on new units, but that lead-time is decreasing quickly due to the significant investment that Fecon made late in 2017 to double production of the Stumpex. Buyers can even participate in a program where they can come to the factory to see their Stumpex assembled. They can then take it home when assembly and testing have been completed.